Macquip was established in 1986 with the objective of manufacturing high quality screen printing machinery for both the textile and graphic industries. Starting from a single garage making T-shirt Printers, today Macquip occupies a 1500 square metre factory and has a workforce of thirty-five people. Macquip, has become a trusted specialist in the screen printing and pad printing machinery market. Macquip offers an extensive range of screen printing and pad printing equipment, as well as a comprehensive range of inks, chemicals and services such as darkroom exposing and stretching related to the screen printing industry. In addition to offering standard equipment the company researches, develops and manufactures machinery to meet customers' specific printing requirements. Representatives make regular visits to international trade fairs to ensure that the Macquip offering is up to date in the international printing market. 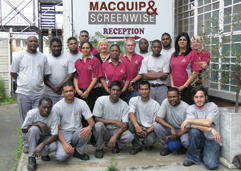 Macquip also reconditions and maintains screen printing machinery. Training on equipment supplied is also provided. Macquip serves a wide range of industries including the electronics, appliance, textile, signage and promotions industries, adding value by analysing customers' screen printing production lines and designing solutions to optimise outputs. It has extended its market beyond South Africa to countries such as Mozambique, Botswana, Angola, Swaziland, Lesotho, Namibia, Nigeria, Kenya, Tanzania and Zambia.